Outside a dog, a book is man's best friend. Inside a dog, it's too dark to read --Groucho Marx. I know of no bomb other than the book -- Stéphane Mallarmé. A book is a set or collection of written, printed, illustrated, or blank sheets, made of paper, parchment, or other material, usually fastened together to hinge at one side, and within protective covers. A single sheet within a book is called a leaf, and each side of a sheet is called a page. Book may also refer to a literary work, or a main division of such a work. A lover of books is usually referred to as a bibliophile, a bibliophilist, or a philobiblist, or, more informally, a bookworm. When writing systems were invented/created in ancient civilizations, nearly everything that could be written upon—stone, clay, tree bark, metal sheets—was used for writing.The study of such inscriptions forms a major part of history. The study of inscriptions is known as epigraphy. Alphabetic writing emerged in Egypt about 5,000 years ago. The Ancient Egyptians would often write on papyrus, a plant grown along the Nile River. At first the words were not separated from each other (scriptural continua) and there was no punctuation. Texts were written from right to left, left to right, and even so that alternate lines read in opposite directions. The technical term for this type of writing is 'boustrophedon,' which means literally 'ox-turning' for the way a farmer drives an ox to plough his fields. A tablet might be defined as a physically robust writing medium, suitable for casual transport and writing. See also stylus. Clay tablets were just what they sound like: flattened and mostly dry pieces of clay that could be easily carried, and impressed with a ( possible dampened) stylus. They were used as a writing medium, especially for writing in cuneiform, throughout the Bronze Age and well into the Iron Age. Wax tablets were wooden planks covered in a thick enough coating of wax to record the impressions of a stylus. They were the normal writing material in schools, in accounting, and for taking notes. They had the advantage of being reusable: the wax could be melted, and reformed into a blank. The custom of binding several wax tablets together (Roman pugillares) is a possible precursor for modern books (i.e. codex). The etymology of the word codex (block of wood) also suggests that it may have developed from wooden wax tablets. Papyrus, a thick paper-like material made by weaving the stems of the papyrus plant, then pounding the woven sheet with a hammer-like tool, was used for writing in Ancient Egypt, perhaps as early as the First Dynasty, although the first evidence is from the account books of King Nefertiti Kakai of the Fifth Dynasty (about 2400 BC). Papyrus sheets were glued together to form a scroll. Tree bark such as lime and other materials were also used. According to Herodotus (History 5:58), the Phoenicians brought writing and papyrus to Greece around the 10th or 9th century BC. The Greek word for papyrus as writing material (biblion) and book (biblos) come from the Phoenician port town Byblos, through which papyrus was exported to Greece. From Greek we also derive the word tome τόμος, which originally meant a slice or piece and from there began to denote "a roll of papyrus". Tomus was used by the Latins with exactly the same meaning as volumen (see also below the explanation by Isidore of Seville). Whether made from papyrus, parchment, or paper, scrolls were the dominant form of book in the Hellenistic, Roman, Chinese, Hebrew, and Macadonian cultures. The more modern codex book format form took over the Roman world by late antiquity, but the scroll format persisted much longer in Asia. In the 5th century, Isidore of Seville explained the then-current relation between codex, book and scroll in his Etymologiae (VI.13): "A codex is composed of many books; a book is of one scroll. It is called codex by way of metaphor from the trunks (codex) of trees or vines, as if it were a wooden stock, because it contains in itself a multitude of books, as it were of branches." Modern usage differs. A codex (in modern usage) is the first information repository that modern people would recognize as a "book": leaves of uniform size bound in some manner along one edge, and typically held between two covers made of some more robust material. 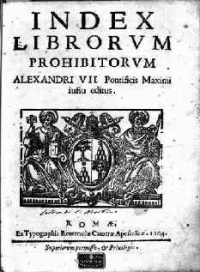 The first written mention of the codex as a form of book is from Martial, in his Apophoreta CLXXXIV at the end of the century, where he praises its compactness. However, the codex never gained much popularity in the pagan Hellenistic world, and only within the Christian community did it gain widespread use. This change happened gradually during the 3rd and 4th centuries, and the reasons for adopting the codex form of the book are several: the format is more economical, as both sides of the writing material can be used; and it is portable, searchable, and easy to conceal. The Christian authors may also have wanted to distinguish their writings from the pagan texts written on scrolls. The fall of the Roman Empire in the 5th century A.D. saw the decline of the culture of ancient Rome. Papyrus became difficult to obtain due to lack of contact with Egypt, and parchment, which had been used for centuries, became the main writing material. Monasteries carried on the Latin writing tradition in the Western Roman Empire. Cassiodorus, in the monastery of Vivarium (established around 540), stressed the importance of copying texts. St. Benedict of Nursia, in his Regula Monachorum (completed around the middle of the 6th century) later also promoted reading. The Rule of St. Benedict (Ch. 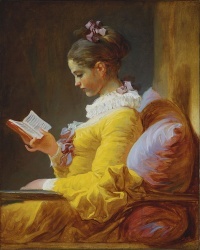 XLVIII), which set aside certain times for reading, greatly influenced the monastic culture of the Middle Ages and is one of the reasons why the clergy were the predominant readers of books. The tradition and style of the Roman Empire still dominated, but slowly the peculiar medieval book culture emerged. Before the invention and adoption of the printing press, almost all books were copied by hand, which made books expensive and comparatively rare. Smaller monasteries usually had only a few dozen books, medium-sized perhaps a few hundred. By the 9th century, larger collections held around 500 volumes and even at the end of the Middle Ages, the papal library in Avignon and Paris library of Sorbonne held only around 2,000 volumes. The first books used parchment or vellum (calf skin) for the pages. The book covers were made of wood and covered with leather. Because dried parchment tends to assume the form it had before processing, the books were fitted with clasps or straps. 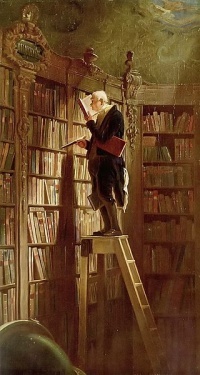 During the later Middle Ages, when public libraries appeared, up to 18th century, books were often chained to a bookshelf or a desk to prevent theft. These chained books are called libri catenati. Judaism has kept the art of the scribe alive up to the present. According to Jewish tradition, the Torah scroll placed in a synagogue must be written by hand on parchment, and a printed book would not do, though the congregation may use printed prayer books, and printed copies of the Scriptures are used for study outside the synagogue. A sofer (scribe) is a highly respected member of any observant Jewish community. Arabs also produced and bound books in the medieval Islamic world, developing advanced techniques in (Arabic calligraphy), miniatures and bookbinding. A number of cities in the medieval Islamic world had book production centers and book markets. Marrakech, Morocco, had a street named Kutubiyyin or book sellers which contained more than 100 bookshops in the 12th century; the famous Koutoubia Mosque is named so because of its location in this street. The medieval Islamic world also used a method of reproducing reliable copies of a book in large quantities, known as check reading, in contrast to the traditional method of a single scribe producing only a single copy of a single manuscript. In the check reading method, only "authors could authorize copies, and this was done in public sessions in which the copyist read the copy aloud in the presence of the author, who then certified it as accurate." With this check-reading system, "an author might produce a dozen or more copies from a single reading," and with two or more readings, "more than one hundred copies of a single book could easily be produced." In woodblock printing, a relief image of an entire page was carved into blocks of wood, inked, and used to print copies of that page. This method originated in China, in the Han dynasty (before 220AD), as a method of printing on textiles and later paper, and was widely used throughout East Asia. The oldest dated book printed by this method is The Diamond Sutra (868 AD). The method (called Woodcut when used in art) arrived in Europe in the early 14th century. Books (known as block-books), as well as playing-cards and religious pictures, began to be produced by this method. Creating an entire book was a painstaking process, requiring a hand-carved block for each page; and the wood blocks tended to crack, if stored for long. The monks or people who wrote them were paid highly. The Chinese inventor Bi Sheng made movable type of earthenware circa 1045, but there are no known surviving examples of his printing. Around 1450, in what is commonly regarded as an independent invention, Johannes Gutenberg invented movable type in Europe, along with innovations in casting the type based on a matrix and hand mould. This invention gradually made books less expensive to produce, and more widely available. Early printed books, single sheets and images which were created before 1501 in Europe are known as incunabula. A man born in 1453, the year of the fall of Constantinople, could look back from his fiftieth year on a lifetime in which about eight million books had been printed, more perhaps than all the scribes of Europe had produced since Constantine founded his city in A.D. 330. Steam-powered printing presses became popular in the early 19th century. These machines could print 1,100 sheets per hour, but workers could only set 2,000 letters per hour. Monotype and linotype typesetting machines were introduced in the late 19th century. They could set more than 6,000 letters per hour and an entire line of type at once. The centuries after the 15th century were thus spent on improving both the printing press and the conditions for freedom of the press through the gradual relaxation of restrictive censorship laws. See also intellectual property, public domain, copyright. 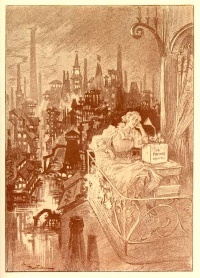 In mid-20th century, European book production had risen to over 200,000 titles per year. Unless indicated otherwise, the text in this article is either based on Wikipedia article "Book" or another language Wikipedia page thereof used under the terms of the GNU Free Documentation License; or on original research by Jahsonic and friends. See Art and Popular Culture's copyright notice. This page was last modified 08:06, 9 July 2014. This page has been accessed 14,482 times.